Vote Loki#1 cover art by Tradd Moore. 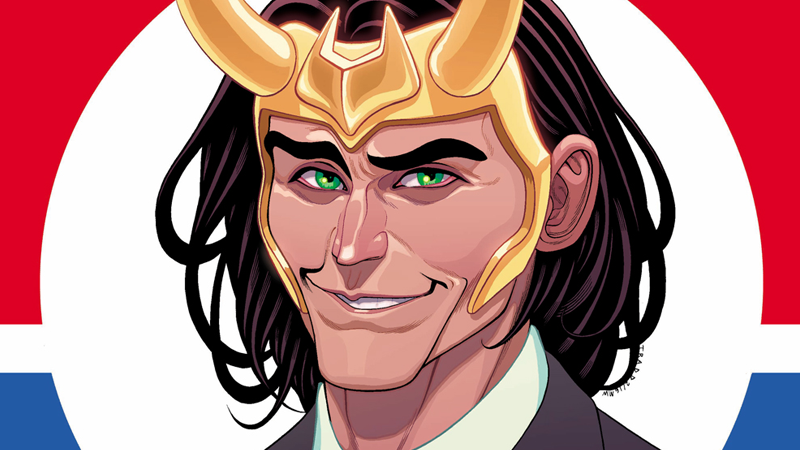 At the beginning of the month, Marvel revealed Vote Loki, a wonderfully timed answer to the ongoing hot mess that is the US Presidential Election. Then we heard nothing... until now. Here are the first details on the comic, which sounds positively delightful. Donald Trump, or the trickster god? You know what, actually, still not even a difficult choice. We now know that Chris Hastings and Langdon Foss are the creative team behind the comic, thanks to a new interview from C2E2 conducted by Comic Book Resources. Hastings even mentioned that Tom King—writer of two of the best comics coming out from DC and Marvel at the moment, The Omega Men and The Vision—originally had the idea for the series before signing on to exclusively write for DC Comics (which makes me monstrously sad that the man behind one of Marvel’s most subversive comics is not writing political satire, Loki-style). The comic does indeed see the trickster god run in the US Presidential Election, although not against real-life potential nominees in the current race. Written through the framing device of a political journalist covering his campaign, Loki and a bizarre cult of followers will be joined by Angela as his head of security, and Sam Wilson will play a major role as Loki’s shenanigans force him to “to take a sudden interest in politics,” according to Hastings. So much of a presidential campaign is about perception and narrative. Truth can get muddy depending on context or lost details, and sometimes the truth even gets flat out ignored by the media and the people because there’s an easier narrative that’s slightly less true but easier or more attractive to follow. Loki isn’t just the god of lies, he’s the god of stories. Manipulating narrative will be what this is all about. Sounds perfect for someone like Loki Laufeyson... although it is a little sad that a Loki vs. Trump confrontation isn’t on the cards. Vote Loki arrives in June, just in time for the Republican and Democratic national conventions.